There are many reasons why one might consider growing roses from cuttings. Not to mention the obvious cost savings involved, as rose growing is often quite the expensive hobby for gardeners to take on, but learning how to propagate roses from cuttings is a great way to create new plants out of your favorite varieties. I have found over the years that while most people know it can be done, finding someone with the experience and know how is often the tough part. I know among my circle of friends, we often admire one another's gardens and we will frequently trade plants that we think will look good in our own gardens. 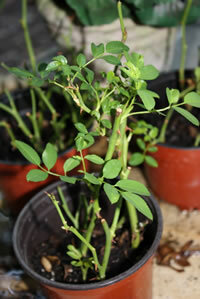 Growing rose cuttings is a thrilling and satisfying experience for a rose lover. Anyone can go to a nursery and buy whatever rose they would like, but to take a simple cutting and turn it into a whole new plant is truly a skill to be valued. I have often taken this skill for granted because it was something I was fortunate enough to be taught early on, so I decided to share what I know in this easy to understand, step by step guide. When you finally get around to taking your cuttings, they have to be planted right away. Rose cutting do not last long once removed from the plant and the longer you wait, the less likely your chance of success. So the first thing you need to do is get your starter pots ready so you can put the cuttings right into them immediately. You will need to use pots that are clean and sterile, as well as the potting soil. This is a step that is often overlooked but easily addressed. The potting soil should be somewhat loose to allow for proper drainage and root development, but it should also be rich and have some kind of a moisture retention agent mixed in with it. There are numerous brands available on the market that fit this bill. Just make sure you read the package and pickup the correct type. Fill up all of your pots, leaving about a half inch of space at the top, and water them heavily until the excess water flows from the bottom. 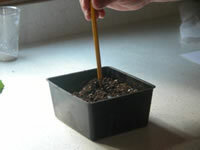 Poke a hole in the center of the soil with a pencil, about halfway down. Then set the pots aside to allow them to completely drain. When you are considering what plants to take cuttings from, you need to look at more than just how pretty the roses are. Not every plant is a suitable donor plant at any given moment. This is something that I see many new gardeners ignore, thinking the new cutting is its own little plant, independent from the parent. While that is true after the cutting has established itself and started growing, you do have to consider the health of the donor plant before taking the cutting. If the donor plant is infected with a disease like blackspot or mildew, it's highly likely that your cutting will be as well and nothing good can come from that. What is the point to propagating a cutting that is starting off its new life with some disease? If you really want to propagate a particular plant, address these concerns ahead of time so you can take healthy cuttings. 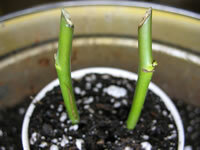 When growing rose cuttings, choose a plant that has either just bloomed, or is in the process of growing new buds. 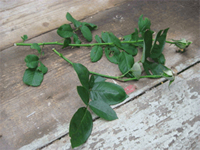 If you take a cutting off of a rose bush that won't bloom, then more than likely your cutting will not either. You should make your cuts using clean and sterile pruning shears. Never use some rusty old pair that you had lying around as it can only damage the plants. Make your cuts at a 45 degree angle somewhere just above a pair of leaves, giving yourself at least 5 to 6 inches of useable stem. It doesn't matter too much right now how long the stems are as we will be cleaning them up just before sticking them into the pots, so if you take a little extra, it's ok. Just don't go too small. Once you have your cuts, wrap them in wet paper towels and take them immediately to the potting bench, or wherever you set your filled pots that you did in step 1. 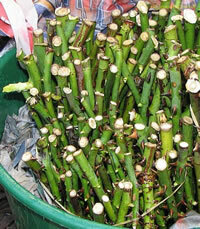 The next step in growing rose cuttings is to prepare the cuttings a little for planting. You want to trim off the bottom of the stems, just below a leaf node or bud, because this is where most of the new roots will form from. Make a deep angle cut just below the node. You will also need to remove all the leaves except for the top set/s. If you want to increase your chances of rooting, gently take away the outer green layer of skin from bottom of the stem, exposing maybe an inch or less of the white flesh beneath. This gives the stem another avenue from which to root. The last step is to get your cuttings planted. You should pick up a jar of rooting hormone from the local garden center as this will greatly increase your chance of success with new cuttings. Dip the bottoms of the stem into a glass of water, and then into the rooting hormone. Tap the stems lightly on the side of the jar to remove excess powder, and then place the stems immediately into the center holes you made in the pots. Gently firm the soil around the stem to hold it in place, but do not compact it down too much. Use a light nozzle of water to give the pots one more good watering and let them drain completely. Then you will need to place the pots into a humid location, or cover them with clear plastic bags. Growing rose cuttings takes anywhere from 2 to 4 weeks and you should keep them in a shaded location that has a constant temperature of around 72 degrees. You will need to make sure that the soil stays moist, but too much water can lead to mold or rotting and kill your cuttings. It's a practice that takes time to perfect and it won't be long before you become a pro!